Once in a generation, the Blood Moon begins its fell cycle, bathing the realm in a pallid light. Compelled by its sinister presence, the restless dead rise from their graves, vampires hunt for unwary prey, and witches engage in nocturnal rituals. Worse yet, the horrifying Werewolf prowls the night, seeking heroes with whom to share his curse. The Blood Moon is an exciting expansion for the classic board game Talisman! 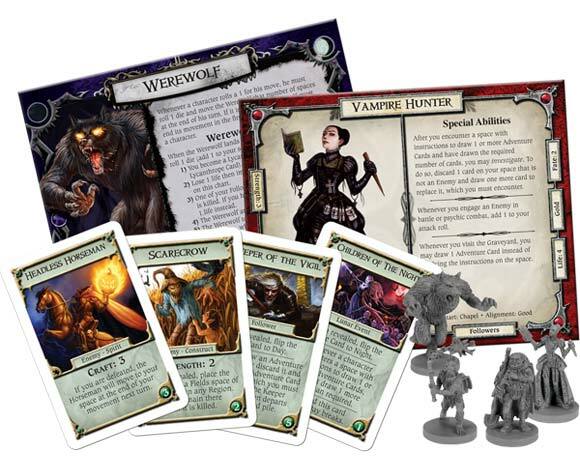 With over 100 Adventure Cards, plus new spells, characters, and alternative endings, The Blood Moon adds a gripping layer of gothic horror to your quest for the Crown of Command. In addition to a host of new challenges, The Blood Moon introduces two engaging mechanics: time alternates between “Day” and “Night,” and a bloodthirsty Werewolf prowls the land. The new Time Card flips between its Day and Night sides to indicate the inexorable passage of time, introducing a range of engaging new game effects depending on its status. Meanwhile, a horrifying Werewolf preys on Adventurers who wander into his hunting grounds. Add a Review for "Talisman: The Blood Moon Expansion"